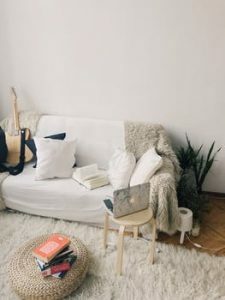 If your flat or your house is a compact home that although affordable has left you struggling to style without seeming cramped then this list is for you. It can be difficult trying to keep a small space in order, especially if you are trying to squeeze too much in. Plus you may find it difficult to select the right pieces that create a chic design that’s inviting yet organised. 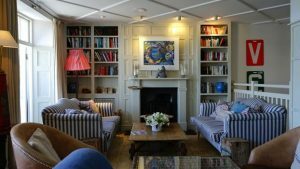 To aid you with this challenging task we have comprised a list of small space solutions you can apply to living room to help combat the lack of square footage. This is an age old trick used by designers and homeowners alike. Having a reflective surface, especially an actual reflection through a mirror, bounces light around the room leaving it feeling brighter and more spacious. Plus having a large area reflected by a mirror will create an allusion of depth. Try placing your mirror on a wall perpendicular to the window as this will make great use of the natural light. In an attempt to make the room look bigger, some people use tiny furniture and even force minimalism in the hope that the gaps between pieces will make the room appear larger. Unfortunately this can backfire and make the room seem static and unlived in. Instead try filling the space with a larger, comfortable piece, such as a large corner or L-shaped sofa. Not only will this mean you can seat a lot more people but it will actually create a cosy and comfortable space you’ll want to snuggle up in. Similarly to how in fashion vertical stripes can create the illusion of a longer length, as can linear prints within a small room can make it appear bigger. Varying geometric and linear prints will give the room structure. Try straight lines on a rug to stretch out the floor space. We don’t mean drink yourself silly but simply try removing the legs from furniture and fixing to the wall instead. Although having space between the furniture and the floor is typically understood to create more space than furniture that is solid, with no legs, if you are working with a tiny space, seeing lots of spindly legs sticking out from under your furniture can actually appear crowded. Try investing in floating shelves or floating console table for your TV. This will emphasise and airy flow around the room. If you have a strange angled wall that is difficult to work with you can create a feature wall to draw people’s attention away from the undesirable space. Try using a busy wallpaper or an eye-catching gallery wall. This one’s for the bookworms. If your living room is a little sad and empty thanks to your respectable attempts to make it appear more spacious, why not put up floor to ceiling bookcase (or as high as you can go). It will let you get creative with your book display, plus plenty of opportunity to display any other.